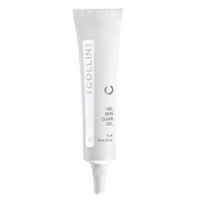 G. M. Collin Gel Skin Clear/Skin Clear Gel - 0.5 fl. oz. Water, Xanthan Gum, Glucose, Chondrus Crispus (Carrageenan), Sorbitol, Ascophyllum Nodosum Extract, Asparagopsis Armata Extract, Biosaccharide Gum-1, Hexylene Glycol, Polyacrylamide, C13-14 Isoparaffin, Laureth-7, Krameria Triandra Root Extract, Dimethicone PEG-7 Phosphate, PEG-40 Hydrogenated Castor Oil, Methylpropanediol, Polysorbate 80, Salicylic Acid, Leptospermone, Isoleptospermone, Flavesone, Salix Alba (Willow) Bark Extract, Ethylhexylglycerin, Centella Asiatica Extract, Madecassoside, Aloe Barbadensis (Aloe Vera) Leaf Juice, Algae Extract (macrocystis Pyrifera, Laminaria, Fucus Vesiculosus, Phaephyceae, Rhodophyceae), Panthenol, Pelargonium Graveolens (Geranium) Oil, Menta Arvensis Oil, Cymbopogon Martini (Palma Rosa) Oil, Citrus Aurantium DUlcis (Orange) Oil, Phenoxyethanol, Caprylyl Glycol, Sorbic Acid, Sodium Hydroxide.